HOW: Take the Thank A Dance Teacher Challenge! Let's make dance education go viral! #ThankADanceTeacher is a global movement to shine the spotlight on dance teachers and give credit where credit is due and often gone unnoticed. It was started in 2014 by the National Dance Education Organization to inspire fundraising and social action for dance education on Facebook, Twitter, and Instagram.The goal of #ThankADanceTeacher is to financially support the professional development of dance teachers to impact teaching excellence in the field. NDEO urges dance enthusiasts of all kinds (dancers, students, teachers, dance dads & moms, fans, etc.) to take the Thank A Dance Teacher Challenge by posting videos or "unselfies" on social media December 2-31, 2014 and give to the Thank A Dance Teacher Day Fund. Instead of capturing your physical self in a photo (aka "selfie"), turn your camera around, and capture your appreciation for your dance teacher(s) by writing it on a sign. NDEO has created several examples of language for you to post on your sign. You can use these examples, or create your own. Please use #ndeothanks and include www.ndeo.org on your signs. Post your unselfie on Facebook, Twitter, and Instagram, and nominate others to take the "Thank A Dance Teacher Challenge." 1. Record a short video of yourself performing a series of dance steps. Mention that you are taking the "Thank a Dance Teacher Challenge" and would like to thank your dance teachers… (insert names). Organization to support high quality dance education. Nominate others to take the challenge. Remind your viewers to give to NDEO by visiting www.ndeo.org/givingtuesday. 3. Share your video on Facebook, Twitter, and Instagram and include #ndeothanks. 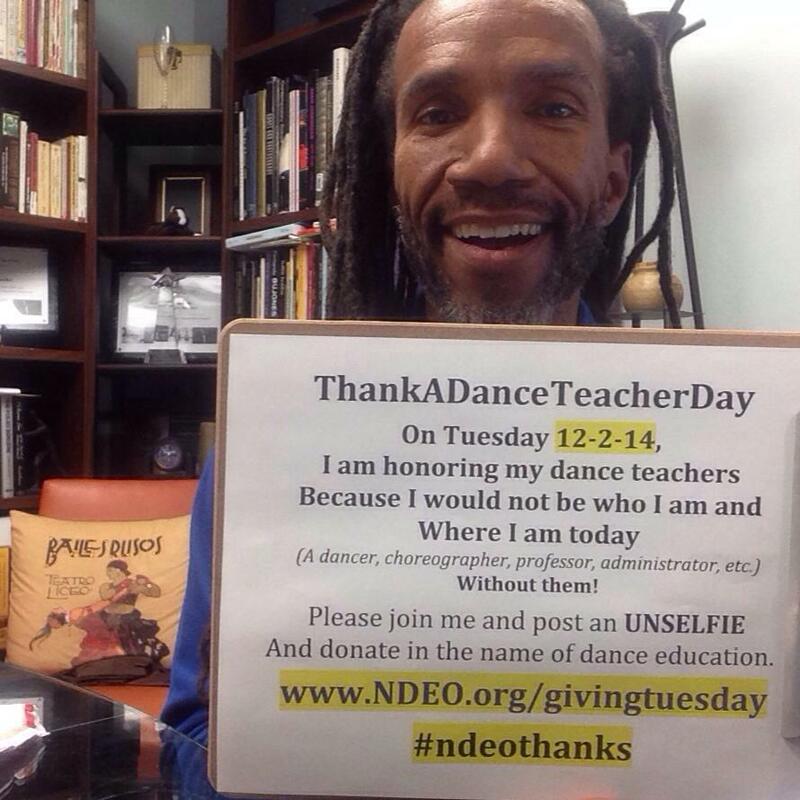 Click here to subscribe to NDEO's #ThankADanceTeacherDay Facebook Event page. 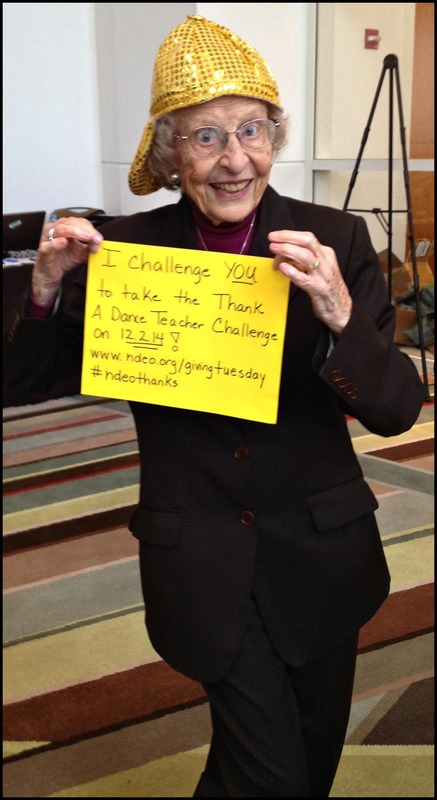 Click here to become an NDEO #ThankADanceTeacherDay Social Media Ambassador.